Blogger Michelle Malkin reports that Miller Beer is sponsoring a pro-[illegal]-immigrant march in Chicago, ponying up $30,000 for the event. Of course, she recommends not cracking open a Miller Beer for your Labor Day bacchanalia. 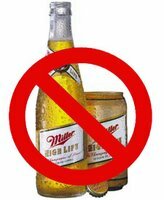 Boycott Miller Beer. What a sacrifice. [snort] I've got a fiancé who brews his own. One would think that since their point is to change latitudes (march on, La Raza! ), that boycotting Corona would be the way to go.